(1) Echocardiography is recommended for the diagnosis and assessment of AS severity. (2) Echocardiography is recommended in patients with AS for the assessment of LV wall thickness, size, and function. (3) Echocardiography is recommended for re-evaluation of patients with known AS and changing symptoms or signs. (4) Echocardiography is recommended for the assessment of changes in hemodynamic severity and LV function in patients with known AS during pregnancy. (5) Transthoracic echocardiography is recommended for re-evaluation of asymptomatic patients: every year for severe AS; every 1 to 2 years for moderate AS; and every 3 to 5 years for mild AS. (1) Exercise testing in asymptomatic patients with AS may be considered to elicit exercise-induced symptoms and abnormal blood pressure responses. (1) Exercise testing should not be performed in symptomatic patients with AS. (1) Coronary angiography is recommended before AVR in patients with AS at risk for CAD. (2) Cardiac catheterization for hemodynamic measurements is recommended for assessment of severity of AS in symptomatic patients when noninvasive tests are inconclusive or when there is a discrepancy between noninvasive tests and clinical findings regarding severity of AS. (3) Coronary angiography is recommended before AVR in patients with AS for whom a pulmonary autograft (Ross procedure) is contemplated and if the origin of the coronary arteries was not identified by noninvasive technique. (1) Cardiac catheterization for hemodynamic measurements is not recommended for the assessment of severity of AS before AVR when noninvasive tests are adequate and concordant with clinical findings. (2) Cardiac catheterization for hemodynamic measurements is not recommended for the assessment of LV function and severity of AS in asymptomatic patients. (1) Dobutamine stress echocardiography is reasonable to evaluate patients with low-flow/low-gradient AS and LV dysfunction. (2) Cardiac catheterization for hemodynamic measurements with infusion of dobutamine can be useful for evaluation of patients with low-flow/low-gradient AS and LV dysfunction. (1) AVR is indicated for symptomatic patients with severe AS. (2) AVR is indicated for patients with severe AS* undergoing coronary artery bypass graft surgery (CABG). 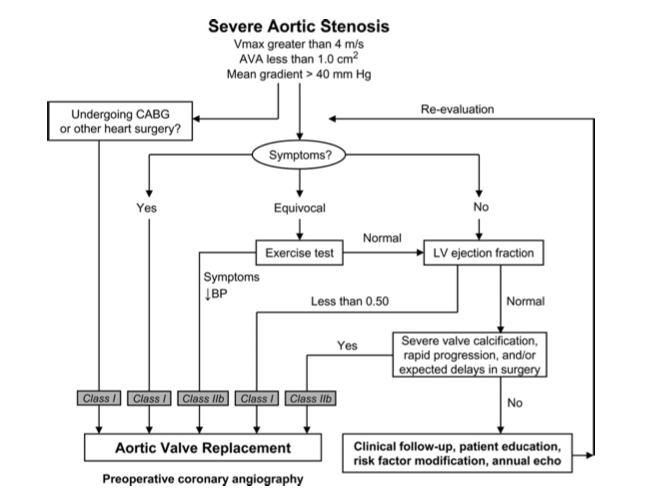 (3) AVR is indicated for patients with severe AS* undergoing surgery on the aorta or other heart valves. (4) AVR is recommended for patients with severe AS* and LV systolic dysfunction (ejection fraction less than 0.50). (1) AVR is reasonable for patients with moderate AS* undergoingCABG or surgery on the aorta or other heart valves. (1) AVR may be considered for asymptomatic patients with severe AS* and abnormal response to exercise (e.g., development of symptoms or asymptomatic hypotension). (2) AVR may be considered for adults with severe asymptomatic AS* if there is a high likelihood of rapid progression (age, calcification, and CAD) or if surgery might be delayed at the time of symptom onset. (3) AVR may be considered in patients undergoing CABG who have mild AS* when there is evidence, such as moderate to severe valve calcification, that progression may be rapid. (4) AVR may be considered for asymptomatic patients with extremely severe AS (aortic valve area less than 0.6 cm2, mean gradient greater than 60 mm Hg, and jet velocity greater than 5.0 m per second) when the patient’s expected operative mortality is 1.0% or less. (1) AVR is not useful for the prevention of sudden death in asymptomatic patients with AS who have none of the findings listed under the CLASS IIa/IIb recommendations. (1) Aortic balloon valvotomy might be reasonable as a bridge to surgery in hemodynamically unstable adult patients with AS who are at high risk for AVR. (2) Aortic balloon valvotomy might be reasonable for palliation in adult patients with AS in whom AVR cannot be performed because of serious comorbid conditions. 1. Aortic balloon valvotomy is not recommended as an alternative to AVR in adult patients with AS; certain younger adults without valve calcification may be an exception.